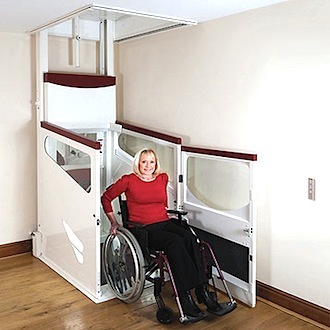 Enjoy the freedom of your home with a wheelchair through floor lift. Why be restricted to the ground floor of your home? You don’t need to move to a bungalow or ground floor flat! Regain the freedom of your home by travelling between floors smoothly, quietly and safely in our Harmony wheelchair through floor lift. The installation of a through floor lift is straightforward and our expert installers at Able Healthcare will keep disruption to a minimum. Following the initial survey and decision to proceed, any necessary preparatory work will be undertaken and then the lift fitted in less than two days. Operation is simple. Having called the lift from the easily accessible wall control switch, a push of the appropriate direction button signals in the car to travel up or down. The aperture ceiling panel is automatically lifted or replaced en route. To exit the car, simply follow the procedure in reverse.